"Another is the lunar mare [volcanic plain] area is not only composed of basaltic lavas, but also explosive eruption-formed pyroclastic rocks," Xiao added. "The latter finding may shed light on … the volatile contents in the lunar mantle." China's Yutu rover traveled about 374 feet (114 meters) on the moon in a zigzag fashion after touching down in December 2013. Map showing where moon missions have touched down. 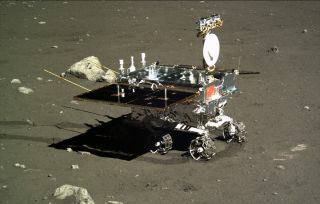 Yutu (whose name means "jade rabbit") is part of China's Chang'e 3 moon mission. Chang'e 3 delivered Yutu and a stationary lander to the lunar surface on Dec. 14, 2013 — the first soft touchdown on the moon since the Soviet Union's Luna 24 mission in 1976. The rover was equipped with cameras and three main scientific instruments — the Lunar Penetrating Radar (LPR), the Visible Near-Infrared Spectrometer (VNIS) and the Active Particle-Induced X-ray Spectrometer (APXS). The new study, which was published online today (March 12) in the journal Science, reports results from the camera and the LPR, which can probe about 1,300 feet (400 m) beneath the moon's surface.